I built Safe Gun over 24 hours at HackUVA with two friends as a proof of concept for a data-powered smart firearm. My roles in this project were designing and assembling the hardware, writing the firmware, and building the front-end. We won a Best Hack award for this project. The motivation for this project, in the wake of the Parkland shootings and with the hackathon corresponding with the March for our Lives, was to see if we could design a safer gun. The result was a smart gun that took a different approach- focusing on collecting and being informed by data to improve safety. While our original idea was for this to be something that police officers could use, with the onboard camera being a substitute for the sometimes unreliable body cameras, and the dashboard being something that could be monitored by dispatchers in real time. We think there's a notable use case too for personal firearms- automatically disabling the weapon in highly populated areas, and being able to track location allows the gun itself to act as a mobile gun safe, with additional safety features and data collection capabilities. 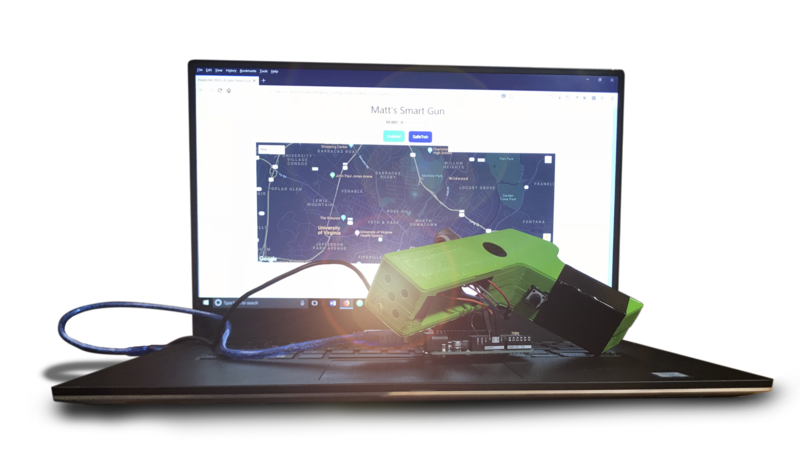 The hardware end of the Safe Gun was designed to simulate key aspects of what a data-driven smart gun might look like. I designed the CAD for the 3d-printed enclosure, and wired up a button to simulate trigger fire, an LED to indicate trigger pressing, and a piezo-electric buzzer to indicate a shot fired, along with a web-camera for video recording. While we initially wanted to use a Dragonboard or Raspberry Pi with more impressive processing capabilities, I ended up wiring everything up to a tethered Arduino due to the limitations of the hardware available for us to use. The firmware was built using C for the Arduino, in tangent with a locally hosted Node server to read data streamed from the Arduino. From the software side, we built an externally hosted node server running the front-end, which integrated with Google Maps to allow us to do things like location tagging and automatically locking the gun at specified locations. The front-end also allowed users to see a past log (with video footage), disable the gun remotely, and call for help. Some other things I built was a script to record video using Python and OpenCV, and some feature optimizations for the Node servers. Next steps for this project would be to improve the amount and quality of the data we're collecting, and to design hardware for a version that could actually be mounted on a real gun.